Laser speckle imaging (LSI) is able to provide full-field perfusion maps of the renal cortex and allows quantification of the average LSI perfusion within an arbitrarily set region of interest and the recovery of LSI perfusion histograms within this region. 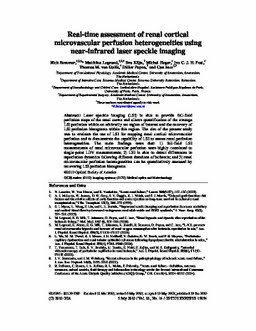 The aim of the present study was to evaluate the use of LSI for mapping renal cortical microvascular perfusion and to demonstrate the capability of LSI to assess renal perfusion heterogeneities. 3) renal microvascular perfusion heterogeneities can be quantitatively assessed by recovering LSI perfusion histograms.